This the kind of meal that comes about by scouring the refrigerator and cupboards to see what you can use! We had leftover cooked chicken, lots of fresh green onions, cheese, burrito shells, etc., so we went for the Chicken Enchilada option. I made a cheese sauce with extra sharp cheese, and mixed that into the shredded chicken and chopped green onions and other spices for the filling. (So, technically, that makes this NOT an enchilada since we had no green chilis, but the spirit is there!) 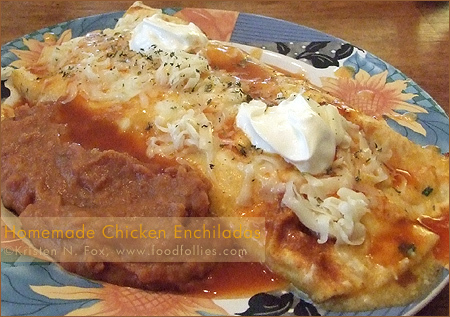 Then, we rolled it into burrito shells, topped with canned enchilada sauce (Ahhh, THERE’S the enchiladas! Nevermind what I said before! ), and lots of shredded cheese, and then baked the whole thing for 45-55 minutes or so. I really like some of your posts…will bookmark your blog.